I am a big believer in playing fair. I think it has to do with being a middle child. I was never the first or the last in my family; things had a way of being evenly handed out and I was content. The world, however, doesn’t always play fair. I have felt on the receiving end of a pretty severe cosmic crap storm for the past 5 years. I hold the hope that the tipping point has been reached and the scales will once again come back into alignment. There’s a reason my icon on this blog is a Weeble™. That is because when I get knocked down, I get up again, you’re never gonna keep me down…. Yes, that’s a song lyric. Yes, it’s one of my anthems. A couple of recent blows have me wondering who decided I was the cosmic punching bag again. One is in the form of a mental health professional who seems to have lost her mind. The other is a trip down memory lane through my divorce and parenting plan that I thought I’d never have to take. Both are minor bumps in the road compared to real problems, like losing people you love. They are annoying just for that reason – why do little things like this rear their nasty heads just when you think it’s safe to think all’s well? The therapist issue isn’t even my own. It’s someone my son saw his junior year in college for a brief period. She billed four sessions to my insurance from January to March, and the company I work for changed carriers. I provided her with the updated information but those bounced, too. There was a new step in place that was needed that I was unaware of. All of this happened after my dad died and just as my mom was diagnosed with weeks to live. I wasn’t focused on insurance at the time – I was focused on caring for my family and dealing with my own grief. That was the main reason my son was seeing her – he was also trying to figure out how to deal with his loss and what it meant to him. So rather than work with him or me on this, she sent the account to collection. I have been trying to unravel this over the last 11 months and have finally made some headway. Because of HIPAA regulations, since my son is an adult, I don’t have access to any of his records, including billing for this. I’m caught in the no man’s land of being the insurance holder but having no visibility into the account. So far, I can’t get the therapist to respond to any of my emails, voice mails, regular mails, or even a certified letter from my son requesting his treatment records. How can I help fix something when I can’t see it? I am sorting through it using every angle I can find, but it has taken a toll. There is nothing worse to me than being told I owe someone money when I always pay my bills. I have been trying all along to work with this person to get it resolved and it feels like she has opted to take the lazy route and throw it over the fence to a collection agency. I keep writing them telling them I dispute charges, which have changed from about $800 for 4 sessions to now $3,800 with no explanation why. I won’t pay that – he has insurance and it will be covered. I won’t be intimidated into paying more than I owe. So then there’s my ex-husband. There are a couple of defining moments in my dealings with him during our separation and post-divorce. One moment that is crystallized in my mind: we were standing in the garage of our old house, having moved out there to continue our rapidly escalating conversation so the kids wouldn’t hear. I wanted to have a clause in our parenting plan to provide for post-secondary education for both kids. It was a given that we would want them to go to college and we would pay. I wanted it included so that years from then, when they were ready to go, we knew what we would be committed to. He said to me “But what if they turn out to be jerks? I don’t want to have to be responsible to pay for them then!” I remember looking at him with horrified wonder – how could any parent ever feel that way? They were our children! Unconditional love is something that is hard to define, but in that moment, I knew I had it for my two kids and that his was based on something else. It was very telling. Another moment came after the divorce, when we shared time with the kids 50-50. He was explaining to me that he didn’t want to become a “Disneyland Dad” to the kids. I asked him what that meant and he said it was a dad who always took the kids places and bought them things to stay connected. He didn’t want to have to compensate the kids for not being there. After all, the divorce was my fault. I think I can safely say that neither of those two things happened. Our kids have turned out to be wonderful human beings who are interesting and flawed and funny and challenging – just like every other human on this planet. The short story is that since the year 2000, I have supported the kids living full time with me and have outspent my ex by a factor (which I was forced recently to calculate) of 4:1. They both opted to live with me full time when they reached 6th grade because it made their lives easier. I didn’t ask for child support since it might mean my ex would insist that the kids had to live with him 50% of the time as the support order required. I wanted them with me and didn’t need his money, so it was an easy decision for me. In those same 12 years, he has contributed about $270 per month to reimburse me for medical or educational costs for the kids that we were to share. He considers that his “child support” and feels he’s done his part. He told me in August that he wasn’t willing to pay for all of our eldest’s college costs and was opposed to paying his full hare of our daughter’s because she chose to attend a private school without consulting him, and the tuition was higher than the state school level that is outlined in our divorce agreement. I finally had had enough. I heard my parents in my head telling me to fight it on principal and defend the kids. I hired a lawyer and had three goals in mind: 1) Not be bullied by him, 2) shine a light on his cheapness and his failure to do anything remotely resembling 50% of their support, and 3) make him squirm. It wasn’t about the money necessarily – I paid a lot for the attorney, but it was something I absolutely had to do or I would have felt resentment over allowing him to once again, guilt me into paying for something that he really owed. The issue was addressed through mediation recently, and I was able to achieve my 3 objectives. At one point in the mediation process, the mediator leaned forward and asked me “So, has he always been such a cheap S.O.B. ?” I had to answer yes. It was one of the main reasons we were no longer married. Objective #2, check. The cost to him has been high, not in money, but in respect and his relationship with his kids. Neither one wants to have a relationship with him at this point. It will take time for them to heal from this and it will really be up to their father to try to undo the damage. Both kids heard his message loud and clear – his money was more important to him than they were. He would rather pay an attorney than pay for their books and fees. In the end, it was pretty clear who had turned out to be the jerk. By trying to save a few dollars, he lost what has real value – something most parents can’t even put a price on. I still believe in playing fair. It’s part of who I am. I am back to standing upright and am hoping that no more wobbling is in my future – at least for a while. I would truly appreciate a period of calm, an even keel life. 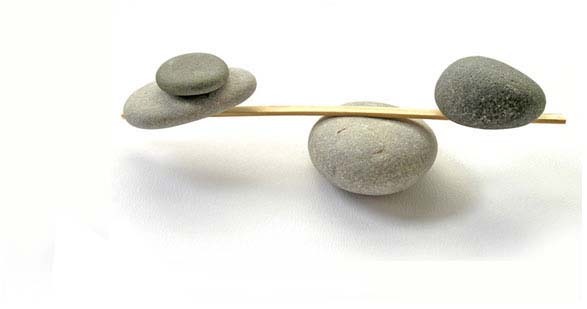 And if that happens, I will change my icon picture from my Weeble™-y self to something more serene and balanced. This entry was posted in Family, General Rambling, karma and tagged balance, child support, Divorce, weebles. Bookmark the permalink. Thanks, Mik. It is one of the worst parts of all of it – and this was our last financial obligation together – I think he just couldn’t let it go without making a fuss to remind me that I caused all of this 17 years ago. So sad…. I hope for you peace and happy times ahead. Don’t know how the nnns got there!